I know, I know, I'm not supposed to attack my own side. Except, Tim Stanley is not on our side though. If you are not helping us, you are hurting us. And while such issue illiterate drivel could be excused from a rank and file Ukipper, this is a columnist for a leading British broadsheet newspaper. This this must be called out for what it is - lazy irresponsible hackery that damages the case for leaving the EU. Our side depends on having a credible alternative and a Brexit plan - and to be able to secure the confidence of opinion formers. 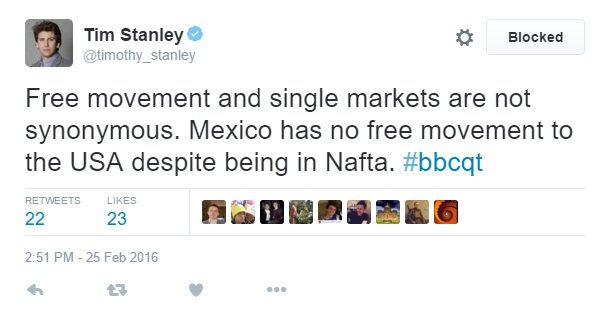 Without going into too much detail, the EU-Mexico agreement pertains mainly to tariffs, and like so many of the Toryboy ilk, the concept of non-tariff barriers is evidently alien to Tim Stanley. Unimpeded single market access goes well beyond mere tariffs. We are talking about customs channels, inspection regimes, mutual recognition of standards and qualifications etc etc etc. In a debate already rich with idiocy, we do not need to Johnny-come-latelys piling on their own ignorance - adding more fuel to the Ukip fire that actively undermines the credibility of the campaign. So in that regard, Tim Stanley should be treated as just another lazy media parasite filling column inches for its own sake. Somebody in his position has no excuses for knowing so little when this issues have been discussed at length on Twitter and elsewhere since even before the general election. Our campaign must be able to demonstrate that Brexit is not a risky proposition and that we have good answers to serious questions. One of those questions is continuity of trade and market access, and an EU-Mexico deal doesn't even begin to compare with EEA membership. Not even close. This is Janet and John stuff, whereby if such details are really beyond Stanley, then he should do us all a favour and go head up the Telegraph's home and gardens section instead - where his ignorance can do the least harm. Does this really need to be spelled out again? Shut up, Skeletor. Nobody cares about Greece. All over bar the losing. Vote Leave launch Brexit "plan". The laughable hypocrisy of eurosceptics. In a battle of visions, Ukip loses. Don't be like Martin Wolf. Just what the hell is CCFICS22? What is the point of BBCQT?